WooHoo! We made it to double digit days! Although I’ve got to say the last day or so has been tough because I keep breaking and losing things. The zipper on my sleeping bag broke in the middle of the “night” (it was still light at 12:30a) last night. Tried to fix it while laying there, but gave up, fortunately it wasn’t too cold. Then I couldn’t find the cover for my chair when we broke camp. My best guess is that it blew away in the wind while we set up camp the night before and neither of us noticed. On top of all that, I lost the lens cap to my camera at some point. Oh well. We were off at 8:45a today…Based on the recommendation of a person at camp last night, our first stop was at the Five Finger Rapids Recreation Site. It was a neat little spot that educates about the steamers going up and down the Yukon river during the gold rush, and how they ended up blasting out one of the rapids to make it safer. There was a staircase going down toward the river but we elected to skip it. 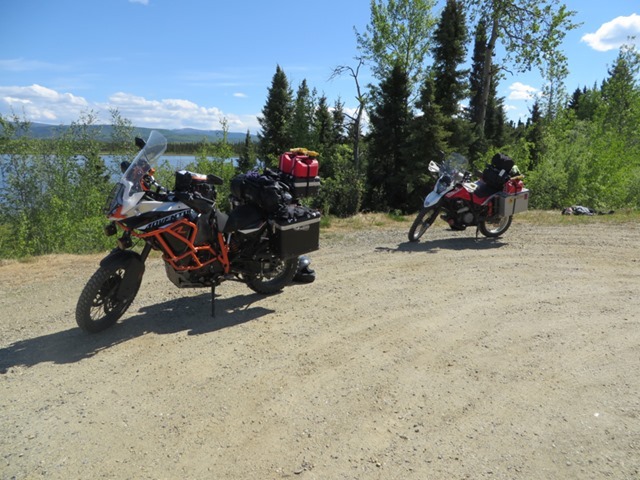 The old man was feeling a bit groggy, so we stopped at a rest area at Gravel Lake. There are tons of nutrients in the lake and lots of waterfowl use it as a resting spot during migration (both directions). Sure enough, there were a bunch of birds there :). A quick pic of the bikes at the lake, and the old man playing dead. 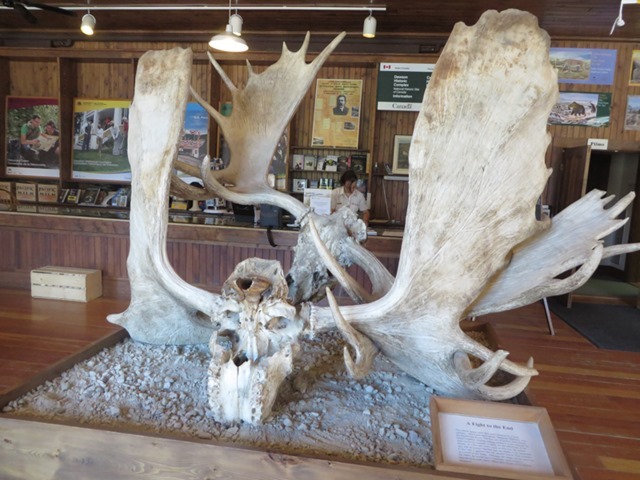 We stopped by the Yukon and Northwest Territory visitor centers to get an update on the Dempster Highway. The ferries have only been running for about a week. The road conditions are good, and all the campgrounds are open (ie no bear issues yet). There are showers in the forecast for tomorrow and Friday – enough wet to keep the dust down, but not enough to turn it into a muddy mess. 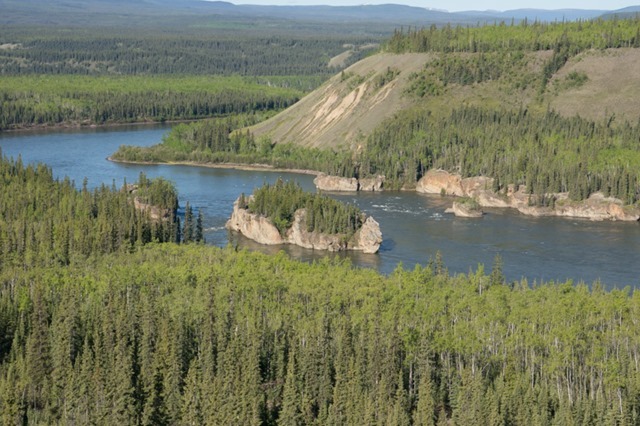 Right now, we are planning on taking a rest day tomorrow and then start the trek to Inuvik on Friday. 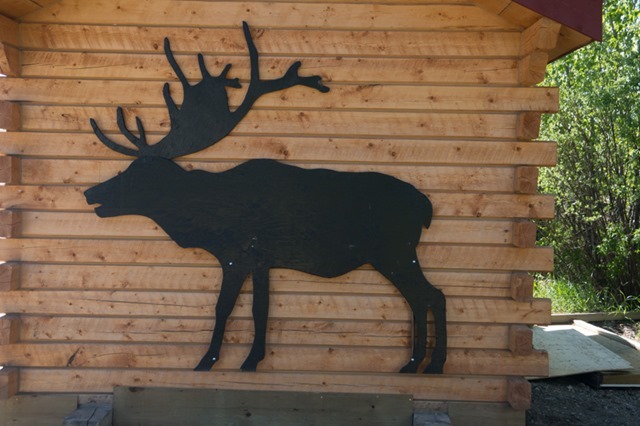 The Yukon visitor center had a cool display of two moose racks that were locked together. Apparently they were battling it out during mating season, and there best guess is the smaller moose was killed instantly and the larger one either starved to death or got taken down by a predator. 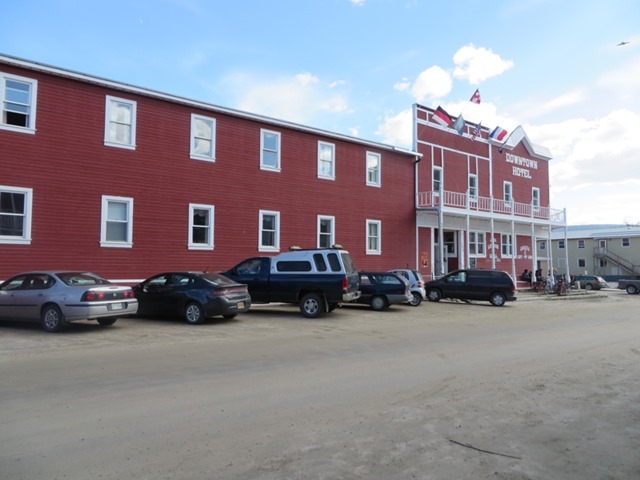 Based on the recommendation of the lady at the NWT visitor center, we walked over to The Drunken Goat for some dinner. 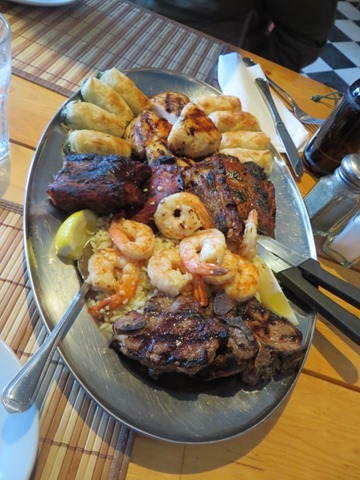 We split one of their sampler plates that had lamb, shrimp, ribs, and chicken. Also tossed back a couple of beers. Good thing I am on a diet. Back at camp I still needed to figure out the sleeping bag zipper issue. I’m not a tailor, so please forgive my non-technical zipper jargon. The “slider” had come off one side of the “teeth”. My plan was to bend open the gap wide enough to slide the teeth back in, and then clamp it down. It worked…almost I was fine tuning the fix and busted the slider. The zipper was the kind with two sliders facing opposite directions. So, I removed the other slider and reversed it’s direction. 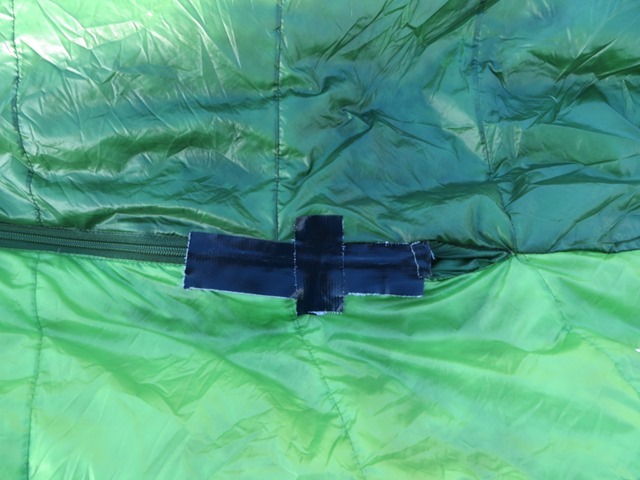 Then I started zipping up the sleeping bag, and taped the bottom together to act as a stopper. Seems to be working for now!